I love decorating our house! Some days I wish I had all the money in the world to just go buy what I want, put it up, and be done. But most days I get thrilled with the "mission" I get to go on in order to find exactly the right piece. I'm not a Pottery Barn catalog kind of decorator. Not that there's anything wrong with that, but I prefer to have a look that can't be replicated by turning to page 18. I've especially had a challenge in decorating because apparently the color blue, is out. Who knew? Not that I care. It's not going to make me love the color any less. But it does make finding things to decorate with, a bit harder. Even finding rugs for the kitchen proved to be a challenge. If I wanted brown or green or black, I would have had a rug after the first store. But since I wanted blue, it took 6 stores. Yes, six. It also doesn't help that my style is a bit eclectic. My latest saga has been curtains. They are expensive! And we don't have your standard 84 inch windows in this house. They are 96. So, all the pretty curtains (even the ones that go on sale at the stores) are way too short. I've thought about adding fabric on the bottom, or top to make them the right size, but finding fabric has proved to be another challenge. Then I thought about just making my own curtains, but I need over 40 yards to do all the curtains downstairs. YIKES! So even my "bargain" 5 dollar a yard fabric would cost over 200 dollars for curtains. 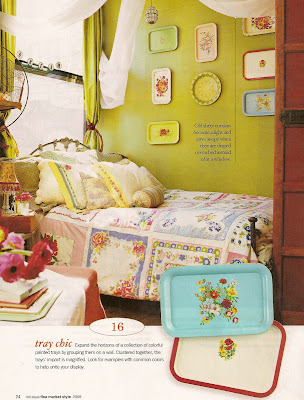 SO, I found myself flipping through my favorite magazine, "Flea Market Style." It's put out by Better Homes and Gardens and has some fantastic ideas. I had looked through it a few dozen times, but this past weekend I saw this page again and was "inspired" for my curtains! If you can patchwork vintage hankies to make a duvet...why not curtains? My sweet husband thinks its a crazy idea, but today I found this. I love all the colors in it and the vintage feel. I had seen this crib set before when I was looking for design inspiration for a friend and loved it, but now i know why! Unfortunately these curtains are 300 dollars for ONE SET! (and of course they are 84 inches so they wouldn't work anyway). So now I am on a "mission" to find vintage handkerchiefs! I couldn't be more excited!! That is SO fun!!! If you just want plain old curtains (ever), you might try IKEA. I think theirs are longer than 84". I love the idea and can't wait to see your finished product!! I somehow lost your feed and have missed your last few posts, but I LOVE this post and the pages that have inspired you! I can't wait to see what you come up with! I think that sounds like a wonderful idea! I hope find them!